Mouth ulcers are painful round or oval sores that form in the mouth, most often on the inside of the cheeks or lips. They're usually white, red, yellow or grey in colour and are inflamed (red and swollen) around the edge. Although mouth ulcers can be uncomfortable, especially when you eat, drink or brush your teeth, they are usually harmless. Most mouth ulcers will clear up by themselves within a week or two. You only need to see your GP or dentist if the ulcer gets worse or lasts for longer than three weeks, or if you develop ulcers regularly. Mouth ulcers are very common, particularly in women and young adults. Most people will have one or two a year. However, some people have mouth ulcers that come back regularly. Recurrent mouth ulcers are estimated to affect about one in every five people in the UK. Most minor, single mouth ulcers are caused by damage to the mouth, for example by accidentally biting the inside of your cheek while eating, or from a sharp tooth, food or filling. 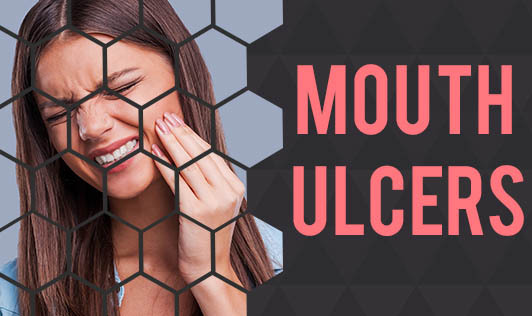 The cause of a recurrent mouth ulcer is not always clear, but it's likely to be a combination of factors including a genetic vulnerability and a certain trigger. Possible triggers may include feeling stressed or anxious, eating certain foods, hormonal changes and stopping smoking. In some cases, recurrent mouth ulcers are a sign of an underlying health condition, such as iron deficiency anaemia or Crohn's disease. Most mouth ulcers heal within 10-14 days without causing any lasting problems, although severe ulcers may last for several weeks and could potentially leave a scar. If you have a mouth ulcer that is particularly painful or is interfering with your daily activities (such as eating), some self-help measures and medications may help. These can include using a soft toothbrush when brushing your teeth, avoiding hard and sharp foods, and using a mouthwash, spray, gel or lozenge to reduce the pain and help the ulcer heal faster. Read more about treating mouth ulcers.